Considering partnering with a fellow author to co-write a novel together? Before you dive right in, there are several factors to consider. My book, Business Tips and Taxes for Writers, details a few key areas to look into before you sign that contract. “Before you enter into a partnership, even if it i just a verbal agreement, discuss with your partners everything that can go wrong. – Discuss expectations and vision. – Evaluate what each partner brings to the table. – Discuss how to share workload. – Discuss profit-sharing. 50/50 rarely works. It isn’t very often that I advise authors to enter into partnerships. There is a lot to consider, and issues can get tricky. Need help making this decision? 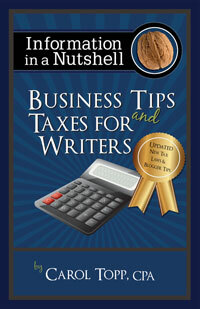 Business Tips and Taxes for Writers is a great resource that has much more to say on this topic. For additional advice, see my recent blog post on writing with a friend.